In 1848, when a series of revolutions broke out across Europe, Pest, Vienna, and Prague were among the cities at the forefront of experiments with political reform. In Hungary, under the leadership of Lajos Kossuth (1802.1894), the diet rapidly proclaimed a new constitutional regime in April (the April Laws). This arrangement confirmed Hungary’s existence independent of other Habsburg territories, promised liberal rights of citizenship and enfranchisement to many more inhabitants (although not to Jews or to small property owners), and maintained full enfranchisement for any noble, no matter how poor. The Hungarian reformers postponed any significant transformation of the manorial system, a tack that pleased the broad gentry class and nobility but did little to satisfy the peasantry. Furthermore, the April Laws imposed the Magyar language on state and society, and this tended to diminish revolutionary unity, provoking opposition among leaders in Croatia and Transylvania who rejected Magyar predominance and insisted on using Latin in their communications with the government. In fact the question of defining the nation and the privileged role of the Magyar language helped to alienate many who spoke other languages and who might otherwise have sympathized with the new liberal constitutional regime. Later in 1848 and 1849 the Habsburg military carefully exploited this alienation as the dynasty struggled to reimpose control over Hungary. 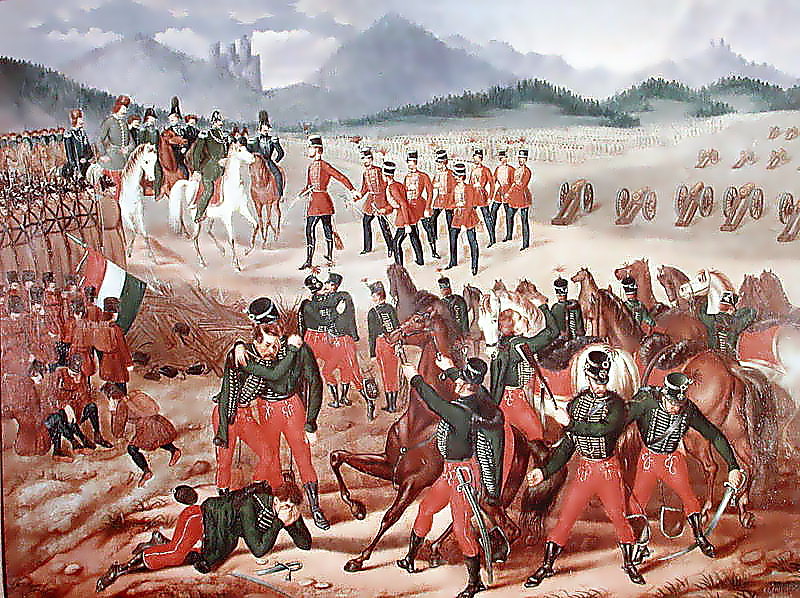 The dynasty’s strategy of divide and conquer ultimately provoked the Hungarian revolutionaries in turn to depose the Habsburgs and to declare full independence in April 1849. In Vienna the government collapsed in March 1848, Metternich fled, and the emperor;s advisors promised a constitutional regime with liberal franchise laws, civil rights, the abolition of censorship, and, eventually, an end to the remaining vestiges of serfdom and the manorial system (which in Galicia were considerable). Occasional outbursts of popular violence in Vienna throughout the spring continued to drive the revolution further to the left, until the court found it expedient to remove itself to the safer, more conservative city of Innsbruck. In July an Austrian parliament elected by means of an extremely generous suffrage set about writing a constitution, and it too was eventually removed to the sleepy town of Kremsier/Kroměříž. in Moravia in order to avoid the political pressures exerted by the radical crowd in the streets of Vienna. At the same time, the issue of political nationalism came to the fore in several different and often contradictory contexts. Austria sent a large delegation to the Frankfurt National Assembly, which struggled in 1848 and 1849 to forge a new united Germany. Liberal Austrians who sat in the Frankfurt National Assembly tended to share an idealistic vision of a future united Germany that would include the non-German-speaking Habsburg territories. The inhabitants of these territories, it was imagined, would receive linguistic rights where necessary from the fraternal German people, and they would reap considerable benefits from their participation in the high cultural and economic development of the German nation. In fact, using a universal language of inclusion, many Austro-German liberals imagined their nation to be defined by its very commitment to the values of liberal humanism, values available to any struggling people in east-central Europe. At the same time, and in reaction to the events at Frankfurt, Czech national liberal leaders proclaimed their own adherence to an Austria separate from Germany and defined by Slav interests. The (bilingual) Bohemian historian František Palacký(1798–1876), who had been invited to participate in the planning process for the Frankfurt National Assembly, used the occasion of his reply to articulate this Austro-Slav position most effectively. Calling for an Austria organized around a principle of Slav solidarity, since this would protect the so-called smaller nations of central Europe from German and Russian hegemony, Palacký argued that had Austria not existed, it would have had to be invented for this very purpose. In June an informal Slav Congress even met in Prague, although its activities tended to demonstrate the difficulties of forging a common program that would unite the political interests of Czech, Polish, Ukrainian, Slovak, Serbian, and Slovene speakers across the Monarchy. Many historians have since judged nationalism rather than liberalism to have been the major source of discontent in 1848. Such a judgment accepts the nationalist rhetoric of 1848 at face value, and views it in the context of modern nationalist sensibilities, rather than in terms of the specific and limited meanings that attached to such language over 150 years ago. The fact that Austro- Slav declarations by Czech nationalist leaders caught their German-speaking counterparts in Bohemia by surprise should alert the observer to the relative novelty and insignificance of the national issue to most Austrians in 1848. Nationalist discourse became a critical vehicle for conveying regional demands that year, but the nations it invoked were largely figments of the nationalists’ own imagination. More often than not, regional and class loyalties far outweighed their nationalist counterparts. German and Czech-identified deputies to the Austrian parliament from Bohemia (many of whom were bilingual) agreed more often with each other, for example, than they did with German-speaking delegates from Lower Austria or Styria. And unlike their Polish noble counterparts, Polish-speaking peasant deputies to the parliament sought an immediate end to all forms of manorialism. Many historians of 1848 have also argued that the work of the constitutional committee at the parliament in Kremsier constituted the last possibility for a friendly constitutional understanding among the various ‘‘nations’’ of Austria. Indeed the work of the committee provided a notable model for later Austrian constitutions, but the compromises achieved by the committee emerged from its members’ powerful conviction that their common liberal sympathies far outweighed nationalist differences. Whether they held centralist or federalist views, German national or Slav national orientations, the men at Kremsier largely put aside their differences over the latter issues to produce a bill of rights and state structure that would have transformed dynastic Austria into a genuinely constitutional regime. Their efforts, however, would not pay off for another twenty years. Already in the summer of 1848 the regime had begun to reassert its dominance against the revolution, even against its more moderate proponents. In June, Field Marshal Prince Alfred Windischgrätz successfully laid siege to Prague, ending both the Slav Congress and a radical student uprising there. In October the military besieged revolutionary Vienna, long since abandoned by the court and most moderates. In early December the regime replaced the faltering Emperor Ferdinand with the eighteen-year-old Francis Joseph I (r. 1848–1916), and in the spring of 1849 the new emperor and his prime minister, Felix Schwarzenberg, sent the Austrian parliament home, imposing a constitution of their own devising on Austria. Later in 1849, with the help of the Russian military, the Austrians finally managed to defeat the armies of the Hungarian rebels, and in 1851 the emperor decided to rule openly as an absolute monarch by abrogating the constitution he had issued a year before.